MOUNT PROSPECT, IL (BRAIN) — Cycling participation remained relatively flat in 2012, up a negligible 0.4 percent last year to 39.3 million, according to the latest numbers from the National Sporting Goods Association. BOULDER, CO (BRAIN) — Sales of outdoor products fell 1.7 percent in May compared to the same month last year, according to the Outdoor Industry Association VantagePoint report. Triathlon sees largest average annual increases. WASHINGTON, D.C. — About 141.9 million Americans got outdoors last year to exercise and take part in at least one of the 43 outdoor activities that the Outdoor Foundation tracks. BOULDER, CO (BRAIN) — Supplier sales remained down through April compared to last year but suppliers regained some ground from the first quarter, according to the BPSA Topline for Cycling RetailTRAK from Leisure Trends Group. WASHINGTON, DC (BRAIN) — Imports of adult bikes — 24-inch wheel sizes and higher — were up 292,875 bikes over the first quarter in 2012, a 20 percent increase, according to Thursday's release of bicycle import statistics from the U.S. Census Bureau. MONTEREY, CA (BRAIN) — Supplier sales were down double digits through the first quarter as unseasonably cold and snowy weather continued to hammer many parts of the country in March, according to the BPSA Topline for Cycling RetailTRAK from Leisure Trends released Tuesday. BOULDER, CO (BRAIN) — Outdoor product sales saw a 7.6 percent uptick in sales in March, driven by outdoor apparel, footwear and hardgoods sales — and led by sales through online and discount/mass retailers. ALLENTOWN, PA (BRAIN) — The publisher of the American Bicyclist Study, a market study of adult bicycle consumers, is offering suppliers and retailers a chance to review an electronic copy of the study at no charge for 30 days. BOULDER, CO (BRAIN) — Sales got off to a slow start at independent bicycle dealers this year. While total dollar sales held steady at $145 million, unit sales slipped 2 percent in January, according to sell-through data from Leisure Trends Group. 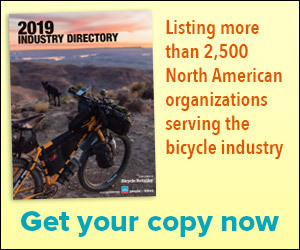 BOULDER, CO (BRAIN) — Independent bike dealers rang out last year on a high note, with December sales of $218 million, up 3 percent from a year earlier, to propel full-year 2012 merchandise sales to $3.3 billion, according to Leisure Trends Group’s RetailTRAK data. PHILADELPHIA, PA (BRAIN) — Bicycle Product Suppliers Association members’ shipments to bike shops grew a modest 2 percent last year to 2.6 million bikes. BOULDER, CO (BRAIN) — Sales at IBDs bounced back in November after October declines, with overall annual sales remaining on track for a record 2012, according sell-through data from the Bicycle Product Suppliers Association and Leisure Trends Group. TAIPEI, Taiwan (BRAIN)—The number of complete bicycles exported from Taiwan dipped slightly in the first nine months of the year, but the units’ value continued to climb. BOULDER, CO (BRAIN) — Leisure Trends Group and the National Sporting Goods Association have reached an agreement that will provide NSGA members with access to retail sales data from Leisure Trends' Sporting Goods RetailTRAK program. WASHINGTON, DC (BRAIN) — Suppliers imported 16.2 million bikes though October this year compared with 12.8 million bikes imported over the same period in 2011. Children’s bike categories are up 33 percent overall as retailers hope to get a bike under a lot of Christmas trees this holiday season. BOULDER, CO (BRAIN) — More than 40 percent of independent bicycle dealers report stronger Black Friday sales this year than in 2011, according to research firm Leisure Trends Group. BOULDER, CO (BRAIN) — Leisure Trends Group projects that IBD sales for the year through September have reached more than $3 billion, up 7 percent compared with the same period in 2011. WASHINGTON, DC (BRAIN) — 2012 bike imports reached 14.4 million through September, a 29 percent increase over last year. Suppliers have continued bringing in substantially more kid’s bikes than last year.